Connect With Science is a public event taking place at the Museum of Contemporary Art in Sydney, Australia, on Thursday 30 May 2013 from 7:00 pm-8:30 pm, followed by a mixer. The event is part of the VIVID Ideas festival, and will feature two world-renowned biomedical animators: Graham Johnson (UCSF, USA) and Drew Berry (Walter and Eliza Hall Institute, Melbourne), whose work has received international recognition (BAFTA award, 2004; Emmy award, 2005, MacArthur Fellowship, 2010). They will present awe-inspiring animations showing the intricate molecular machines inside your body. 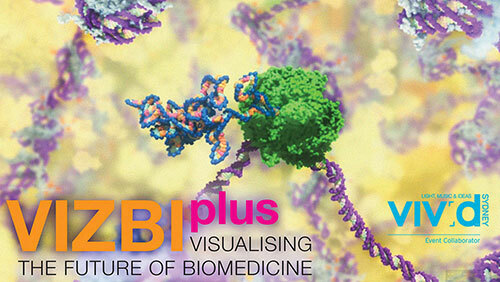 This event is co-organized by ‘VIZBI+ Visualising the Future of Biomedicine’, a new project funded by the Inspiring Australia initiative, the Garvan Institute of Medical Research, the Walter & Eliza Hall Institute, and CSIRO, Australia. For further details, see http://bit.ly/VIVID-VIZBIplus. Does your work bridge science and art? Perhaps you’re an artist inspired by science or perhaps you’re a creative scientist? If so, you have an opportunity to share your work with other like-minded people at the event. Around 8:15 pm, just after the keynote talks and preceding the mixer (8:30 pm onwards), there will be an opportunity for a limited number of participants to briefly introduce themselves and their work to the audience (in approx. one minute, and using one projected image). If you wish to take advantage of this opportunity, please send the image you propose to show (PNG format) plus a one-paragraph description of the work you would present to after you have registered for this event. Submissions close 5pm AEST on Wednesday 22 May. Successful participants will be notified by email on Friday 24 May. We are excited to be able to offer a limited number of travel fellowships to participants based in Australia who need financial help either for purchasing tickets or to get themselves to the event. If you are applying for financial help, in addition to your image and description of your work, you are also required to submit one paragraph explanation of why you need funding and how you plan to “spread the science” from this event back to your community. This entry was posted on Thursday, May 9th, 2013 at 07:30.